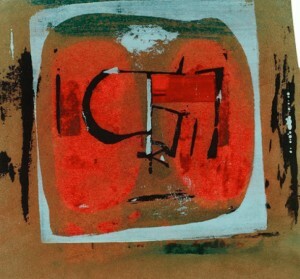 Lanyon was born in St. Ives, Cornwall in 1918. He attended Penzance School of Art before moving to the Euston Road School of Art, London, where he was taught by Victor Pasmore. On his return to St. Ives he met Ben Nicholson, Barbara Hepworth and Naum Gabo – all three of whom had departed London to escape the war, and it was around these artists that the St. Ives School, with Lanyon amongst them, was born. Lanyon’s first one-man exhibition was at the Gimpel Fils in London, 1949. Regular exhibitions there would follow in the fifties, and Lanyon also participated in group shows with the Arts Council and the British Council.